Our “Making Building a Better Experience for All” campaign was named Corporate Social Responsibility Project of the Year at this year’s National Federation of Builders (NFB) Awards. The awards, which celebrate the year’s stand-out construction stories from across the country, also saw the firm scoop two further commendations. The Making Building a Better Experience for All campaign covers a range of initiatives run by Woodhead that have a positive social impact on the communities they serve. From charity drives to its employment and training schemes, community involvement projects and commitment to sourcing materials and labour as locally as possible, the campaign showed the firm’s commitment to its corporate social responsibility. Glenn Slater, Business Development Director at Woodhead, said: “Our commitment is not just to the building projects themselves, but the communities we are working in. We know we have the opportunity as a local SME to deliver social environmental and economic value on the projects we deliver. I believe our work over the past year has shown that. The Nottinghamshire-based company was also highly commended for its Commitment to Collaborative Working in partnership with Nottingham City Homes and Nottingham City Council. The £2.85m project, which was procured through regional procurement consortium, Efficiency East Midlands, was the first phase in the city’s Building a Better Nottingham scheme. Building 26 homes, across four sites, over the course of a year, Woodhead delivered its project on budget and with a number of homes completed weeks ahead of target. They were nationally commended by the Considerate Constructors Scheme for one particular site, while achieving high scores across the board for the remaining three. Steve Hale, Director of Property Services at Nottingham City Homes, said: “It is a great achievement to have been commended for our commitment to collaborative working alongside Woodhead. 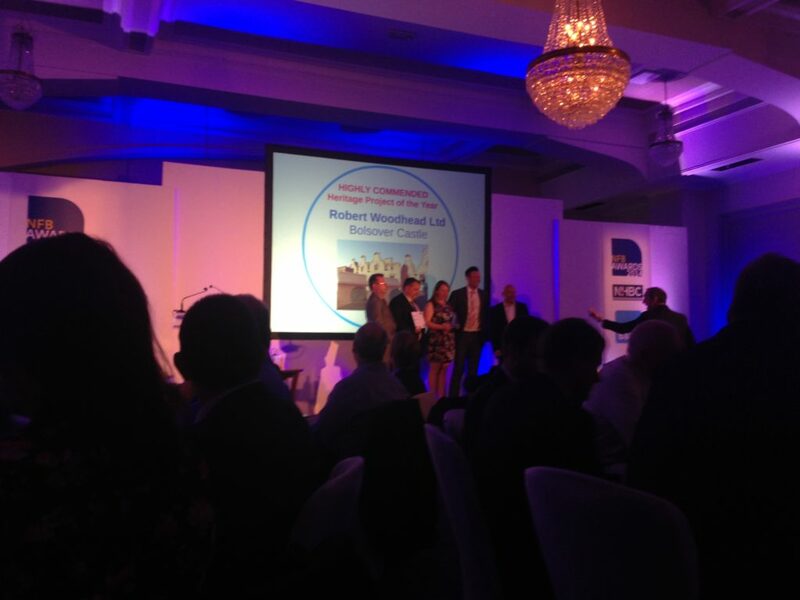 Woodhead’s specialist team, Woodhead Heritage, was also highly commended for its re-interpretation project for English Heritage at Bolsover Castle. – Refinishing rooms in lime plaster, and re-decorating using traditional distemper casein paint.